I invented this game and lead the project through completion, including: costing, sourcing, production, design and testing. This is a game that I designed the visual look for. Street Game Smarts - Coming Soon! I am in currently in the middle of my thesis project! 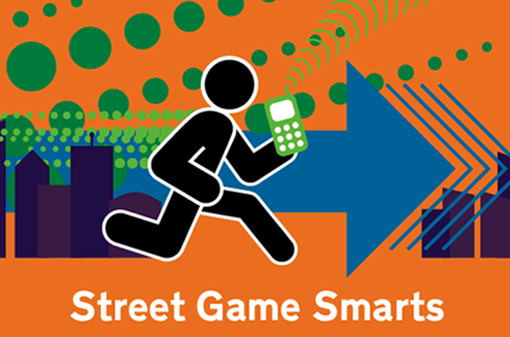 I will be launching a website called Street Game Smarts (www.streetgamesmarts.com) by the end of February to support the first, of hopefully many, street games that I will produce. This was a very brief interactive experiment I did to brighten people's days and test out a low tech version of email forwards. 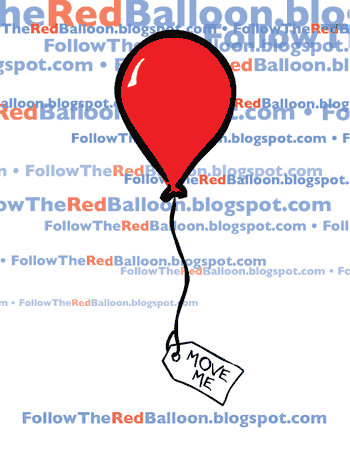 Balloons always make my think of the innocence of my childhood when a balloon would cause a significant amount of joy. I wanted to bring smiles to people's faces, if only for a moment. I'm currently in the beginning stages of a few ideas - some of them farther along than others. So if anything sparks your interest, let me know! Click Read More to see the ideas. 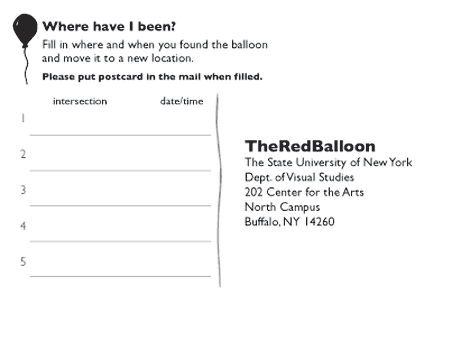 This is an interactive art piece done at the University of Buffalo on January 16th. Posters were hung to days before vaguely advertising that something was happening on the 16th. There were 17 pieces scattered throughout the atrium (a lounge area in the arts building) with very simple tags on them. This is a strategy game with interchangeable parts. I did not invent the initial concept, but worked a lot on refining the play. The pathways around the board are constantly changing so no game is exactly alike. I did a lot of play testing about the grid, path vs. non-path, length, understandability, and other aspects related to the play. This game also has a drawer filled with prototypes and unused ideas. I am very interested in the things people will do in the name of "playing a game." In this game people are given tasks or actions to keep track of - these things ranged from mundane to disgusting to friendly. I was curious how people would react if they could not discover how these tasks/actions they were counting affected their standing in the game until the following day. Tasks and totals can be viewed within the Gallery. This is a picture and text messaging game. The first "test run" of the game was played with 3 people receiving messages and me sending and reacting. Every 15 minutes, starting at noon on a specific day the participants were messaged a picture and asked a question related to it. The first person to reply got their way. This is a card game that went through a lot of revisions, both visually and types of play, before reaching this one. I have a whole drawer filled with different sets of cards (some of them hand drawn and cut out) from all the different revisions. I added good guys, bad guys, and different strengths of each. There are now special cards that also affect the way the game is played. I learned a lot about how to carry out successful play testing sessions with this game. This is the first game that I invented the whole concept for. The play itself isn't too complicated and I like that players always play with their cards face up. It makes the game a lot easier for children. There is also a book that come with the game that I wrote descriptions for each of the difference monsters. This is a card game that I designed the visuals for. I also did a lot of play testing to perfect the rules and find the right balance of cards within the game. Visit here to see more about how the game is played. This is a board game that I designed the visuals for. I also helped edit the rules for clarity. You can visit here to get a better idea of how the game is played. Additional images are in the Gallery. Random Games invented the concept.